The best out of all the transfer papers I've tried!! 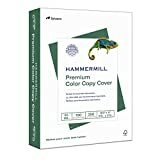 This is the best trasfer paper I have ever tried, and I've tried many! I was making T-shirts and sweat shirts for all of my family and friends when the Sept. 11th incident occured, and the more I made, the more people wanted them. I was taking pictures off the internet and copying them onto trasfers and making the shirts. Eventually I was making sweat suits too! Even before the stores were coming out with them. I can honestly say that these transfers not only looked the best, but held out through many washings! Anybody with a brain can follow the simple instructions on the package. If they can't then they have some serious issues. My 6 yr. old son even knew how to do it! I won't buy any other trasfer but this brand! I used this product over a year ago to create matching shirts for a business organization. The directions were very easy to follow and left us error-free. The shop owner still tells me that they turned out great and they wear them often. I am currently designing another project for her. TITLE? How about "Worst Product I Have Ever Used." This is one of the worst products I have ever used. It gives you no detailed instructions for ironing on, like how long you are supposed to do it; it just says "iron the transfer onto light fabric." It ruined the brand new white tank top I bought for this project...and left me angry and frustrated. I would have given it 0 stars but that wasn't an option! Phone # on package, but you end up with an answering machine, and I did find in very small print (that you aren't looking for when shopping) it does say, "We shall not be responsible for incidental or consequential damages related to the use of this product." I guess that says it all, doesn't it? 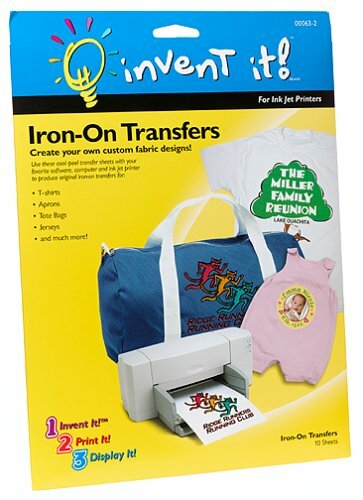 I wasnt sure how these Iron-Ons would work since one of the ratings on them was negative. But I just did a practice iron-on on my daughters shirts. It was so easy and they peeled off very well. My girls love their shirts with their own pictures on them. These are a great buy and worth their money! 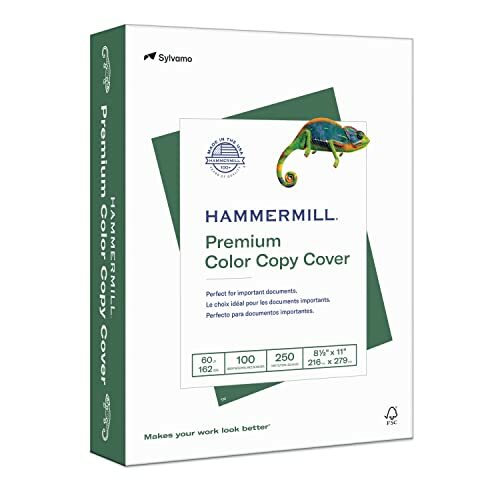 If you have "The Print Shop" you really can't get a better paper product than this. Invent It! tends to take an idea already in the marketplace and put a slightly more "home hobby" twist to it. What Invent It! does here is change the standard configuration of the sheets. Other manufacturers include three, letter-sized sheets with no scoring of any kind. 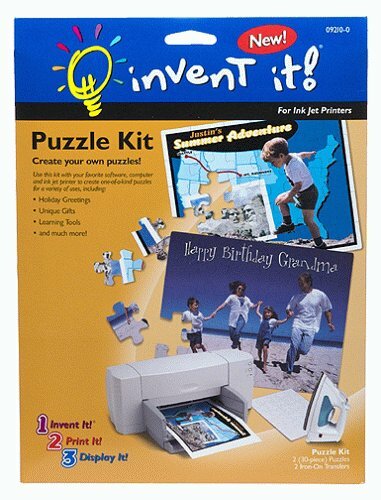 Invent It! gives you one full sheet, one sheet with precut rectangles, and one sheet with precut circles. While I admit that some hobbyists may like the convenience of pre-scored sheets, I personally found it annoyingly limiting to be forced into these shapes. I can't, therefore, see more than a novelty use for this pack. It would make sense if Invent It! created a pack of each kind of sheet, because that would give consumers the opportunity to buy sheets for particular projects. This way, however, you have to spend a prohibitive amount of money to get enough sheets to make even a modest run of, say, magnetic business cards. As for their general quality, Invent It! gives us slightly less powerful magnetics, and a material that is irrevocably stained by water. They are best on kitchen doors, or other areas of highly concentrated, magnetically conducive metal. For example, they hardly stick at all to stainless steel, and they also seem to have their functionality compromised by refrigerated or moist areas. Indeed moisture does seem to discolor the base color of the sheets, permanently changing that color from white to a very dull pearl. Fortunately, the material is such that the design itself will not bleed when wet, as is the case when inkjets print on paper. I must point out that none of the three manufacturers I tested performed much better under what might be considered "extreme" conditions. None stuck to stainless to any great degree, and all discolored under moisture--though others did so less permanently. Invent It! did actually lose some magnetivity when exposed to water after adherence, actually curling slightly under the strain. Other manufacturers, notably Xerox, seemed to have slightly improved magnetics overall, sticking better to more types of metallic surfaces. None seemed eager to be used on already-moist surfaces, but Xerox in particular seemed to withstand moisture better if, for instance, condensation appeared after sticking the magnet to the surface. In sum, then, I think Invent It! would be perfectly fine for making exterior refrigerator or interior car magnets, but this particular collection of shapes will be limiting to most creative minds. Businesses looking to use this product for routine labeling of work areas will be best advised to look for other manufacturers, or even to consider transparent decals. 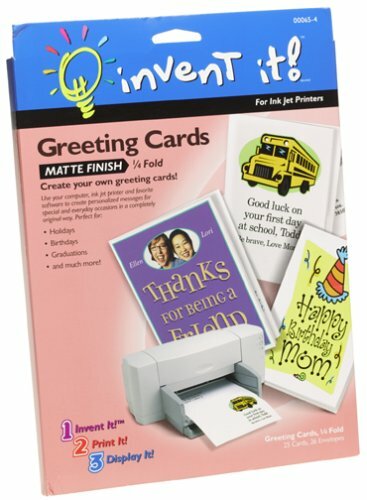 This is my favorite product for all sorts of cards. I even contacted the manufacturer for a purchase source when I couldn't find it myself. I don't care for a 1/4 fold card although that is the finished size I like. I only want one fold in my card. 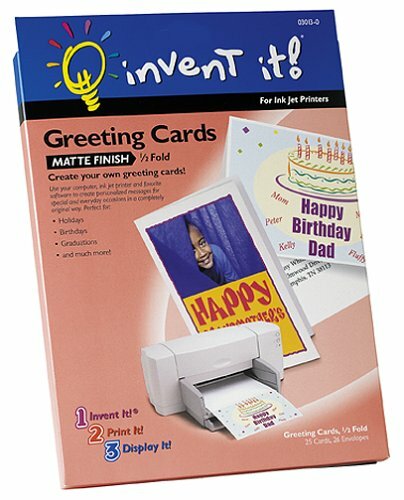 This product lets you print 2 cards on one sheet, then split at the perforation, and fold each of the two cards one time. It's great. 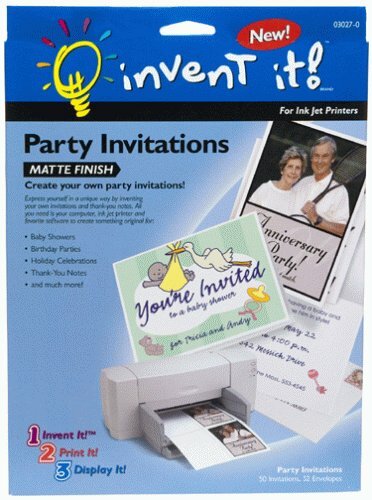 There are some competitor products that do this as well as Invent It's own Matte finish Invitations. The outstanding thing about these is that the outside is GLOSS finish. This gloss finish works great for photos as well as other graphics. I've used this for my photo notecards, Christmas cards, invitations, letters and made up gift packages for others. The reverse (inside) is not gloss finish which lets you write inside with pen if you choose not to use your software to type in your letter/message. The only drawback is that my card making software does not list 'Notecards or Invitations' as a pre-formatted selection. When this is the case, you just have to experiment a little to see which of your choices works best for you to manipulate. For me, the full sheet, 1/2 fold card works and I just had to figure out which portion is card #1 front, back, inside and the same for card #2 and where/direction to place my photo and text. These are more like body stickers. They do not have the tatoo effect, but you can make anything that you want. I used them for a Halloween costume because I couldn't find what I needed and they did the trick. STUPIDEST THING I HAVE EVER SEEN! YOU REALLY SHOULDNT GET THIS PRODUCT! IT IS THE MOST HORRIBLE THING EVER. IF YOU WANT TATTOOS GO TO THE BUBBLE GUM MACHINES BEFORE YOU GO TO THIS! This is one of the worst products I've ever touched. 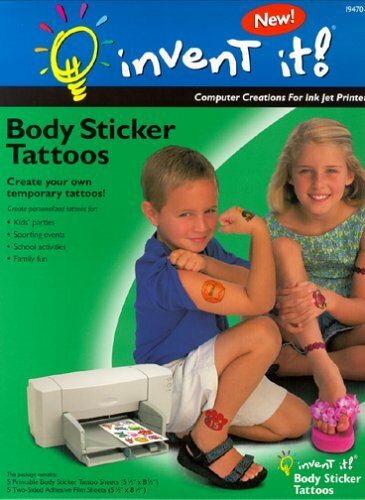 I expected the something similar to the temporary tattoos one would buy at a toy store or get in a box of crackerjacks. Instead this product is more like a very complicated sticker. 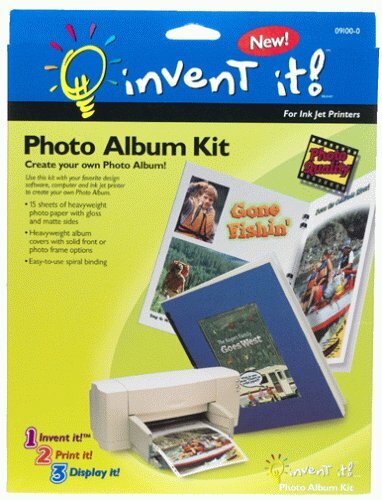 You print to one sheet (making a blurry image), then transfer to a second sheet that you apply to your body with the aid of the typical wet sponge. Rather than the ink transfer you'd expect, you get a clear sheet of plastic glued to your arm. Not only was the result not what I expected, but within 2 hours my suffocating skin began turning blue and red. When I removed the tattoo, merely two hours after application, I was left with a bruise for days and a red mark lasting for weeks. This is a horrible product and I think it would be dangerous to children. Save yourself the trouble and don't waste your money. 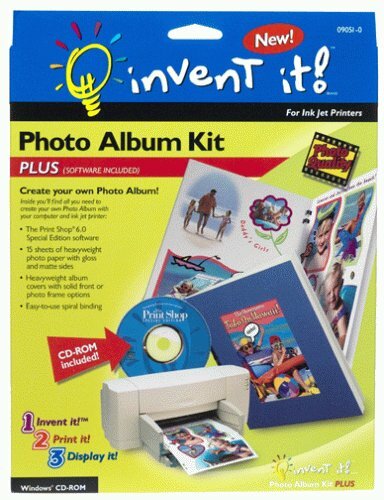 Use this kit with your favorite design software, computer, and inkjet printer to create your own photo calendar based around your 12 greatest photos. Enliven the calendar's pages and your days with witty or poignant clip art, creating not just a useful tool but a cherished keepsake for a given year. I bought three of these calendar kits in November of 2000 and gave them as Xmas presents when completed. The kit contains heavyweight paper for the cover(s) and 15 pages with glossy paper on one side and matte on the other. The glossy side means your photos can be printed at the highest photo-quality setting of your printer, and the matte side (for the month's grid of days) permits easy writing. That is the major draw of the kit. If there is a glossy/matte printable paper out there, I don't know of it (a trip to Kinkos would take care of the binding). The pages are pre-cut with a hole to hang the thing from and holes for the plastic binder. Two clear plastic covers are included, as well as two sheets of sticker paper, to print stickers for placement on the finished calendar. I didn't use them. I have considerable, but non-professional, computer experience, and I found the calendar kit to be a good experience. I composed a calendar of our two daughters, with 12 monthly photos and a cover photo. I used 3.3 Mega-pixel digital images from my new Sony S-70 digital camera at full resolution, and included them at 8"x10" size. High quality images are a must for good results. After constructing the January graphics, I simply altered it for the other months. In total, you need 12 month grids, 12 month photos, cover photo or graphic, and rear cover graphic (if desired). A couple of caveats. First, large photos, particularly dark ones, chew up printer ink. Be prepared to feed your printer ink cartridges. Try to use photos without a lot of dark background, or consider smaller sizes. I decided to pass up on a beautiful photo of a Halloween pumpkin that had an extensive black background. Secondly, I had some difficulty getting the paper to feed into my HP 722 smoothly. I think the printer may not be used to feeding paper with the glossy side DOWN, as is required to print on the matte side. As a result, the printing was tricky, I lost a couple of pages (you get three extra), and it took a lot of time. The large photos, as usual, take a long time to print. I don't recommend doing more than a couple of kits in a short period. Let the relatives compete for your affections. Finally, the heavyweight covers are very nice, but one side is matte white and the other is DARK BLUE (Argh! They should change that, and make one white/white, for the front cover/January). I used one for December/back cover (the "copyright" on the blue side), but used a glossy/matte month page for the front cover/January, with a clear cover on top of it. One less screw-up possible, then. 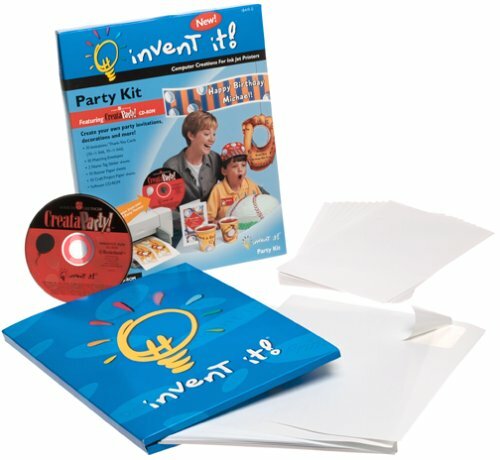 If you need software to compose your calendar, they offer an "Invent It! 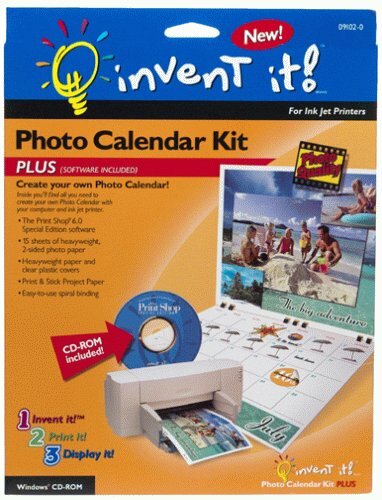 Photo Calendar Plus" version that includes the software. I used my own Corel Print House program, so I can't comment upon the "Plus" version. The results? My mother-in-law said it was "the best present she had ever received," and my Dad said that one of the pictures of our older daughter "brought a tear to his eye." Enough said. If you want to make a calendar this is the only way to go! For four years we've been producing family calendars for Christmas gifts. The first year we let Kinko's do it all for us. That was easy but you only get 1 photo per month with no graphics or other frills. The second year we found some matte/flat paper and printed things on the computer and let Kinko's bind it for us. That was the worst of both worlds and finding that paper again is impossible. Last year I found these kits and bought one with the software. The software wasn't too helpful to me (being the control freak that I am) but the kit itself it wonderful! 15 pages for the calendar, clear plastic or blue paper covers, and a binding. It is literally the perfect set of supplies for this type of project. I used 5 kits last year and may use even more this time. After all, once you get the design down why not make a lot! I use Calendar Creator and MS Publisher to make the calendar and photo displays. You could use their software if you want. 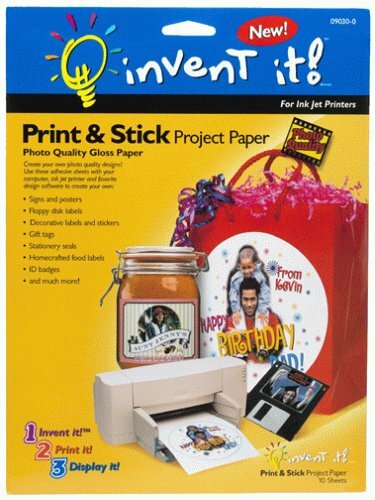 Either way, the paper, covers, and binding in this package are the only way to make calendars with your printer. I highly recommend this to anyone. I've tried the alternatives and this is the best! I made 4 calendars as Christmas gifts for relatives. I found the kit very easy to use, and felt it printed high quality looking pics. I did not like the binding which was too weak to hold a calendar with 15 heavy pages. I ended up taking my finished calendars to Kinko's. For less than $5 each, they added better binding and put protective plastic sheets between the pages. The end product looked very professional and fun. 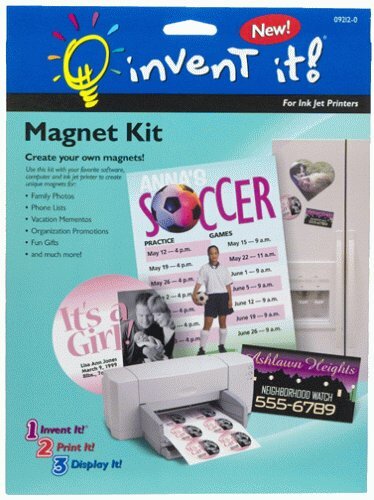 I make a calendar for my daughter from an InventIt kit I purchased last year. The finished product is so amazing and I am so pleased. I would love to make calendars for the rest of my family but I am having great difficulty finding these kits this year. Does anyone know where to get them? Looks great, but doesn't stay on the binder. 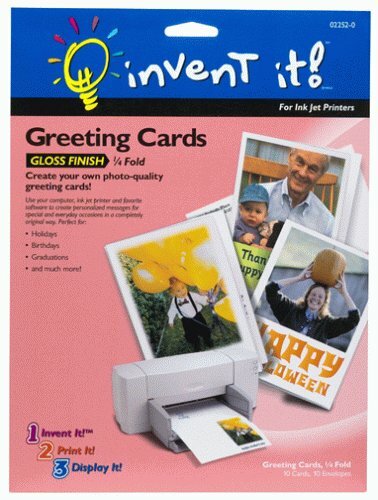 I have used other greeting card glossy finish papers and have found this product the best of all of them. I hope that this product never goes out of production as I know I wouldn't be as satisfied with any other product. My first attempt at greeting cards and they've all come out beautifully. I made 15 Winter Solstice cards (you just don't find those at Hallmark) and they're so pretty that I didn't want to give them away. What if people throw them out?! But I have parted with them all, and only have 10 blank cards left. I'll be ordering more of these. I used Photoshop Elements and, with help from Mikkel Aaland's book, Photoshop Elements Solutions - The Art of Digital Photography (all bought here at Amazon, BTW), turned a picture of my daughter into the goddess offering us the light of the newly reborn sun. I just couldn't believe the results. The cards only made it look better, the inks sank right in but still produced a three dimensional looking image. Having calibrated my monitor (see p. 4 of Aaland), the image on the card looks just like the image on my screen. I never have to buy another not-quite-right greeting card again. I like this set a lot. I just reordered a bunch of new paper sets. I'ld like the SW improved in two areas: - I'ld like to change the size of the calender field relative to the photo space - the automated double sided printing process didn't work for me. After messing up two pages I decided to print each page separatly (takes time). The rest is great, especially the editing capabilities of photos (crop, brightness corrections and color corrections) make this approach far superior to conventional photo prints. 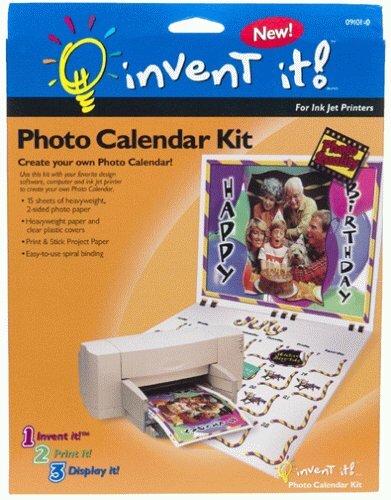 Photo Calendar Plus, like all of the Invent It! products I've tried, is an excellent piece of software. It does exactly what is says it is going to do. The software is easy to use, and the end product is well worth the time you put into the project. 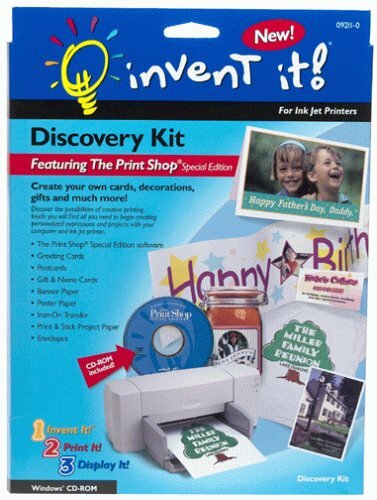 Also, I like the Invent It! paper better than HP paper or Avery. Whether you are new to doing calendar-type crafts or you have been doing it for a while, this software is a good choice. Nowhere does this product or Amazon's description of it say 'not for Mac', and I bought and found out the hard way, so please let others avoid my mistake! 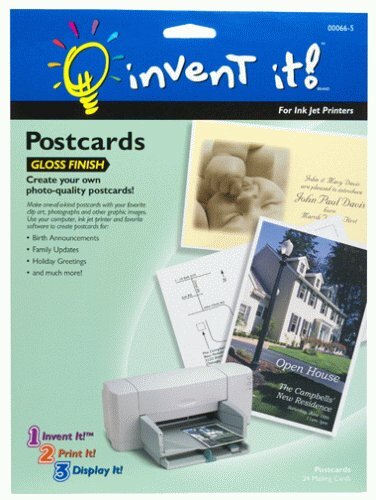 It is hard to find a good HEAVY glossy inkjet paper that will produce photo quality prints with my Epson Photo EX printer. 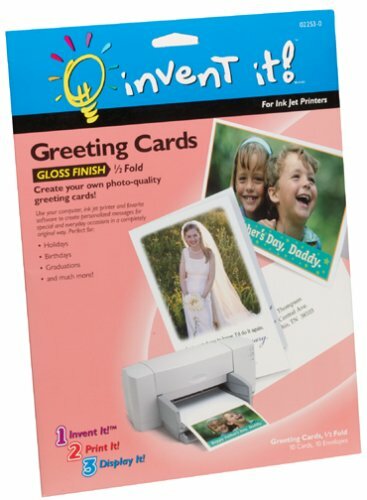 The Epson photo paper works great for one-sided prints, but can't be folded and used for cards. 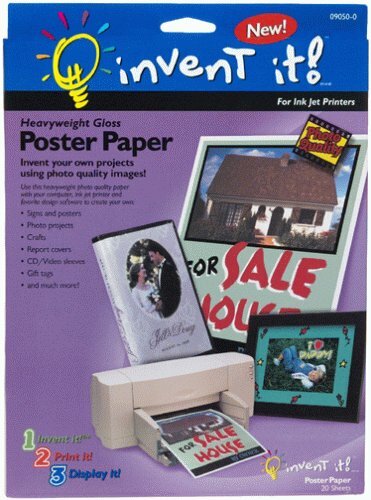 The "Invent It" Poster Paper can! The colors print great! 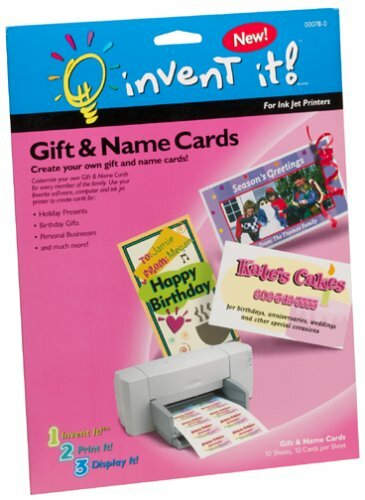 The super heavy weight makes it IDEAL for greeting cards, and, since it is not pre-scored you can make them any size you want with a paper cutter. You have to hand-score the paper to fold it, of course, but that is a simple matter. I use a butterknife with a ruler over a pad of newspaper to score the back for folding...easy! This paper is hard to find in local stores, so I am thankful for Amazon!